Center, Mike Modano, goalie, Dominik Hasek, center, Peter Forsberg, defenseman, Rob Blake, coach, Pat Burns and official, Bill McCreary, were recently announced as Toronto’s 2014 Hockey Hall of Fame class inductees. Photo shows Mike Modano speaking to the media after being inducted into the 2014 Hockey HOF. Modano spoke about the honor along with former Stars general manager Doug Armstrong, via Mark Stepenski Stars.NHL.com. Modano spent nearly his entire career for both the Minnesota North Stars and Dallas Stars after the franchise moved. The offensive machine scored 561 goals and notched 1,374 points for his illustrious career. He won the 1999 Stanley Cup with the Stars after being drafted No. 1 overall by the franchise in 1988. 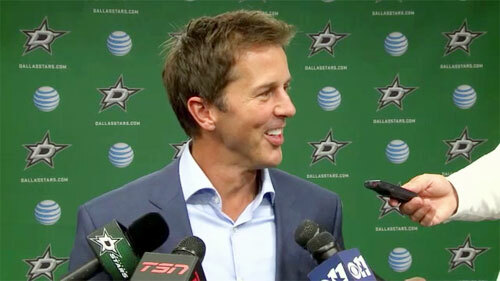 Watch Mike Modano speaking to the media after being inducted into the 2014 Hockey Hall of Fame. Dominik Hašek is a two-time Stanley Cup winner with the Red Wings after an illustrious career with the Buffalo Sabres, including two Hart Memorial Trophies and Lester B. Pearson Awards. Peter Forsberg is a retired Swedish professional ice hockey player and currently an assistant general manager of Modo Sports. Known for his on-ice vision and physical play, Forsberg is considered one of the greatest players of his generation. He Won two Stanley Cups with the Colorado Avalanche and the 2003 Hart Memorial Trophy. Rob Blake is the current assistant general manager of the Los Angeles Kings. He spent 21 seasons in the NHL with Kings, Avalanche and Sharks, recording 240 goals, 777 points. Burns was elected in the builder category. He spent parts of 14 seasons as a coach in the NHL, winning the Jack Adams Award with three teams and capturing the Stanley Cup with the New Jersey Devils in 2003. He also reached the Cup Final in 1989 with the Montreal Canadiens and got the Toronto Maple Leafs to back-to-back conference finals in 1993 and 1994. Burns died Nov. 19, 2010. McCreary was inducted in the referee/linesman category. He officiated 1,737 regular-season games and an NHL-record 292 playoff games from 1984 to 2011. He also worked 44 Stanley Cup Final games, also a record. He worked in three Olympics (1998, 2002 and 2010), including the gold-medal game in each competition, and the 1991 and 1994 Canada Cups. The inductees were chosen by an 18-person committee this past weekend in Toronto. The 2014 Hockey Hall of Fame induction ceremony will take place Nov. 17. Sports Speakers 360 is a booking agent for pro athletes. Click here for a look at past and current NHL players and teams for appearance and speaker fees. If you would like to book NHL stars like Mike Modano or Peter Forsberg for a speaking engagement, appearance or endorsement, contact our booking agent at 1.855.303.5450.